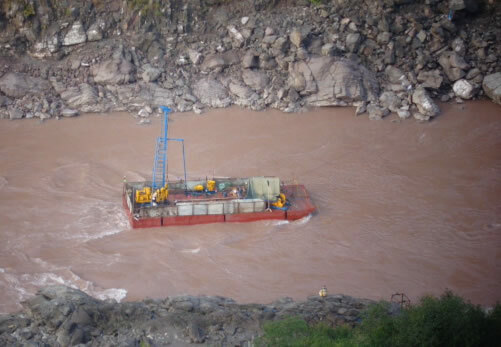 Mahl Hydropwer Project in Pakistan: Proposed 590 MW on Jhelum River & Mahl River at the border of AJ&K and Punjab Province: Boreholes Drilling for Geological Investigation Work. Scope of Work: Drilling of 52 Nos. Boreholes Land Drilling (vertical& inclined) upto maximum depth 235 meters (Land & Submerged Drilling). Total drilling carried out 5,098 meters. Carried out 523 water pressure tests.